You put your heart and soul into creating some stellar webinar presentation. And, you can’t wait for people to hear what you have to say. But, in the process of content creation, you might’ve put the need to get people to actually register on the backburner. Uh oh. It can be a giant letdown when you go live on the day of your webinar only to see some measly number of people joining you. That wasn’t the plan—you didn’t intend to get stood up by your own audience. What was the point in preparing some out-of-this-world presentation when there’s hardly anyone to listen to it? In fact, According to ON24’s report, the conversion rate of webinar registrants turning into live attendees is just 42.9%. So, let’s ensure this scenario doesn’t happen to you. Or, if it has already, that it doesn’t happen again. And that people, well… show up. 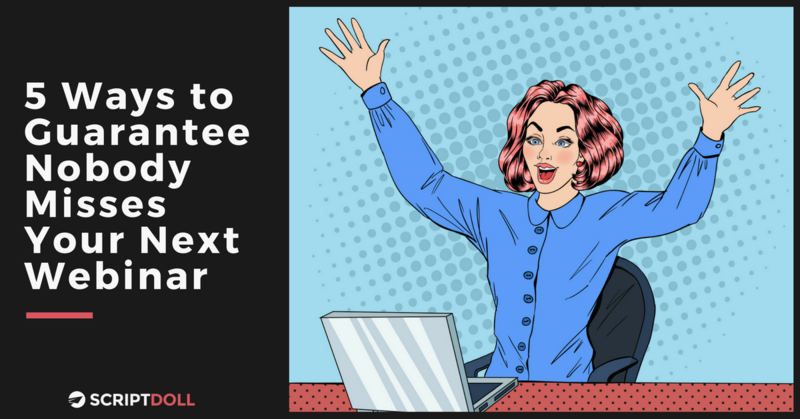 After much experience and talking with clients, I’ve discovered there are 5 ways to guarantee nobody misses your next webinar. And, I’m going to share them with you today. After reading, you’ll know just what to do to increase people’s awareness, excitement, and attendance for your online presentation. But, that’s not all. What’s one thing you receive a lot of when a brand you follow is about to put on a virtual event like this? Emails. Urgh. We get so many of those in our black hole of an inbox. Thus, you might cringe at the thought of having to map out and write a sequence of attention-grabbing webinar emails surrounding your new product or service. But, it’s a must-do to generate the buzz you need among your subscribers and raise those attendance numbers. Good news is, I have just the solution for you. It’s a one-of-a-kind piece of software that can craft the perfect sequence of emails to help promote your webinar in minutes. Sound like something you’d be interested in? I thought so. Stick around below and I’ll let you in on the secret. Knowing how to get your subscribers to show up and listen to your webinar is essential to your virtual event’s success. But, even more is the need to host one that isn’t a complete flop. I’ve attended my fair share of webinars where the content was lackluster. And, there were more than the normal amount of technical difficulties, resulting in me hitting the big red X on the webinar screen to scurry away as fast as I could. So, what are the components of a successful webinar? It’s educational. You’ve got a captive audience. Take advantage of it. Use your time wisely to educate your attendees on your product, service, a new tool, or trick of the trade—the opportunities are endless. It’s well-rehearsed & organized. This is where many entrepreneurs fall short, thinking it won’t be that difficult to put on a webinar or feeling confident in talking about their content. Well, think again. It’s always a good idea to prepare and conduct a dry run—a dress rehearsal so to speak—to review the slides, familiarize yourself with the webinar platform and technicalities, and get any and all nerves out. It’s entertaining. Inject some humor into your webinar to keep your audience’s attention. Now’s your chance to shine, showcasing your personality and humanizing your brand. Otherwise, if you decide to keep it solely technical and filled with details, you’re giving your attendee’s a (roughly) 40-minute free pass to check their email and catch up on work during your event. No bueno. 1. Pick the best day and time. Whenever scheduling a date, it’s important to pick a good day and time that’ll work best for both parties. The same goes for your webinar. It’s critical to getting people to actually attend, not just sign up. You’ll want to avoid scheduling your webinar on a weekend. Clearly—I mean, people do have lives outside of their day jobs. So, with that being said, when exactly is a good day to host? Well, according to Bizibl, Wednesdays will ring in the largest audience, followed by Thursdays and then Tuesdays. Think about your own schedule. Mondays you’re most likely playing catch-up from the weekend. And, Fridays you’re way too distracted by the fact that the weekend is near. Now, onto the tough part—the time of day. With webinar audiences are often dispersed all across the globe, how the heck do you pick a winning time? There’s no doubt that it’s a challenge. To help with that, avoid typical commuting hours (before 9am or after 5pm) and the lunch hour (noon to 1pm). I see a lot of webinars occurring during the prime lunchtime. I get it. People’s schedules are busy. But, do you really want your audience to be more focused on their (hopefully) delicious lunch instead of really hearing what it is you have to say? Didn’t think so. Thus, WebinarNinja found the time for a 1-hour webinar sweet spot to be anywhere between 11am and 2pm, regardless of time zones. Remember, this all depends on your audience and industry. Get to know them and their schedules, and determine what makes the most sense. 2. Create an informative & attractive landing page. Many people take the easy way out and use GoToWebinar’s pre-designed, yet bland landing pages. The downside? This platform oftentimes limits your customization options, conversion rate tracking capabilities, and A/B testing opportunities. As a result, your best bet is to create a custom landing page yourself. LeadPages makes it easy to do this and also integrates with webinar software like WebinarNinja, making the process a piece of cake for you. Who? Who is presenting? What do they do? Share their brief bios. What? What’s the webinar all about? What topics will be covered? Consider creating a hashtag and sharing it in this spot so people can live tweet during the virtual meeting. When? Obviously, you need to include the date and time (and time zone) for your audience to mark their calendars. Where? Explain where and how the webinar will be accessible. Most of the time it’s via a link. And, is an entry password required? I tried to attend a webinar once where the company failed to provide this. Yikes. Why? Shout out the value—what your audience will get for showing up. Here’s a great example of a webinar page done right by WordStream. You’ll see it has a clear headline conveying the benefit, a bright call to action button, bulleted text to tout the authority of the speakers, short paragraphs for easily digestible copy, bolded text, and properly placed subheads. The landing page is where you can also throw in a video of the speaker, if it already exists of course (so as not to create even more work for you). And, drizzle in a sense of urgency or scarcity. I’ve seen brands use something like: There are only X number of seats for this virtual meeting). Even if there isn’t a real cap on the number of attendees, your audience will feel the pressure to register and attend. With all the emails we get a day, it’s a no brainer your subscribers will need constant nudges to be reminded up until the event. So, don’t just send them one promotional email and call it good. Instead, send those who have yet to register a few value-building reminders to reserve their spot. Inject a sense of urgency into them with “time is running out” messaging and reiterate the benefits of attending—ex. An industry expert is sharing tips and tricks; you’ll get actionable insights to implement immediately, etc. And, for those who’ve already registered, don’t leave them in the dust expecting them to remember to attend. 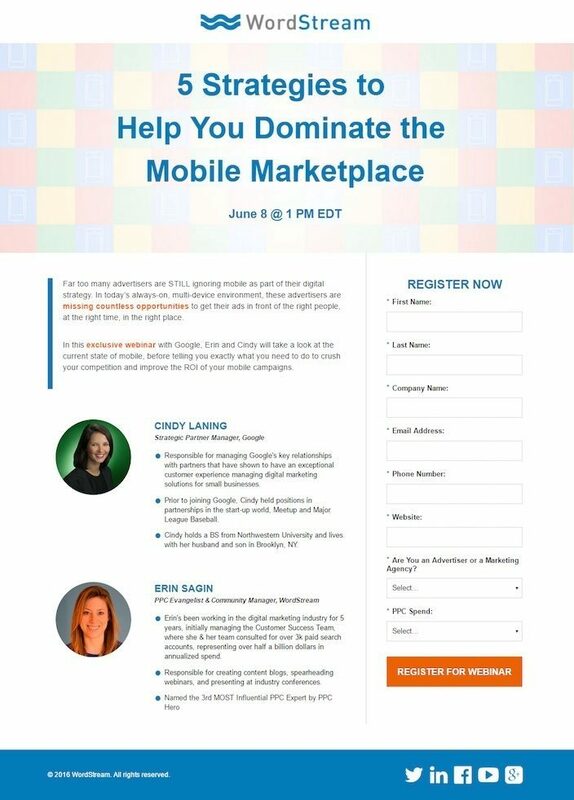 Help keep the webinar top of mind with “don’t forget to join us” messaging, while reintroducing them to why they registered in the first place. After all, things do come up. Give your subscribers a fighting chance to finagle their schedule around so they can still show up. This is where things really get good. Put yourself in your audience’s shoes and think about something you could give attendees. Something that’ll generate excitement. Hold their attention throughout the entire presentation. Make them feel special. And, ultimately, encourage registrants to make an appearance. Maybe it’s the chance to win tickets to an industry conference or popular event, or a free consultation/coaching call, e-course, discount, you name it. Whatever it is, you can include it in your email communications to further drive motivation for people to actually be present during the live event. It could easily be positioned to read something like: “attendees are getting a special 25% discount on X,” with the discount code placed on the final slide of your webinar deck. Ultimately, excited registrants = excited attendees. 5. Market your webinar through social media. According to ReadyTalk, social media is the second most widely used promotional tool for webinars, following email. Reason being, social media makes it much easier to steer clear of bombarding your audience with reminders and promotional messaging surrounding your online event. And, chances are, your email audience is already connected with you on your social channels. Go ahead and leverage it—it’s another opportunity for you to jog their memory regarding your virtual meeting. Pepper in updates to create hype. Ask questions. Link to the registration URL. And, even use your event hashtag (if applicable). Your main goal is to keep your audience engaged from start to finish. And, taking advantage of your social media platforms to do so will make it that much easier for you. BONUS: Cash in on the webinar recording. Whew. The hard work is behind you. Don’t let your webinar sit and rot, however. You can easily repurpose all that great content thanks to the webinar recording, sending it to all who attended. And, I suggest you also send it to those who didn’t—of course, not in the same email, but in a separate one. Especially if you included a special offer for attendees during your presentation. That way, you can use simple video editing software, clipping out the mention of the deal for those who couldn’t turn up. People hold the recording near and dear, especially if they were unable to attend or watch it to the fullest. In fact, ON24 found that 21.7% of registrants watch the video after the live date, and 18.5% of non-registrants do the same. So, cash in on the recording and, chances are, you’ll get something sweet in return: more conversions. Still trying to cozy up to crafting an email sequence that propels your subscribers to attend? Understandable. It’s not an easy thing to warm up to because, when you’re stuck staring at a blank Word document waiting to be flooded with words, it can feel defeating. But, putting together a webinar email campaign should be at the top of your list because relying solely on a few messages to get the job done is pretty lousy. Lucky for you, I’m about to knock your socks off with a tool that’ll get you out of the copywriting rut and help raise your registration numbers. That tool is ScriptDoll, a sales copy engine dedicated to helping entrepreneurs like you compose persuasive sales content. Once users create their product portfolio and answer a handful of painless questions, ScriptDoll will drop those answers into thoughtfully crafted content scripts that sell—sales letters, email sequences, you name it. Best of all, ScriptDoll has just what you need to quickly and triumphantly promote your webinar to subscribers with its “Bill Gates Webinar Promo” Email Sequence Script. This five-part sequence can be set up to deploy 72 hours prior to going live with your virtual meeting and continues up until 24 hours post-webinar. Ultimately, it makes use of a real story about a widely known figure (Bill Gates), capturing the attention of your email list and propelling them to join you (instead of standing you up). Crafts sizzling content for you—thanks to the product portfolio I mentioned earlier, the subject lines, body copy, call-to-actions and even signoffs are all done for you. ScriptDoll provides you with the valuable, personable content you need to give your subscribers a reason to attend your webinar. Keeps the content flowing with a distribution schedule—you won’t need to spend hours trying to figure out when it’s appropriate and efficient to send another email after your first correspondence. The script informs you of the right time to hit the send button on each of the five emails, helping you avoid a horde of unsubscribes or, worse, getting marked as spam. Saves you some serious moola by keeping your copywriting in-house—there’s no need to drop loads of money on outsourcing your writing tasks to copywriters. And, you can also avoid investing hours of your time trying to improve your skills in a copywriting course. That’s because ScriptDoll crafts its effective email templates thanks to its connections with champion copywriters around the world! Get Your Personalized Webinar Email Sequence Today—Join ScriptDoll! You’re now aware of the 5 key things to do to ensure you get more sign-ups and better attendance for your next webinar. Not to mention, a tool that’ll help you write the ideal email sequence to promote your virtual meeting in minutes. Go on and make it happen and never get stood up again by your audience. Entrepreneurs like you are raving about ScriptDoll—relieving them from the struggles of writer’s block while crafting attention grabbing emails for their webinar with little to no effort. We hope you’ll join them and look forward to you getting the results you’ve been searching for. They’re ready and waiting for you. What do you do to ensure registrants don’t miss out on all the great content you have to share? Let us know in the comments section below. We’d love to know what’s working for you.